Southern California has a few pine trees left, I swear. Although this dry climate suffers from numerous wildfires each year, higher elevations bring cooler temps, snow and a pine forest. High desert boulders and yucca plants all the way up to horseback riding around the lake, this region offers outdoor recreation. Don't expect fern hikes or waterfalls everywhere tho. The bark beetle ravages the weak forest and thinning of the forest is a common sight. 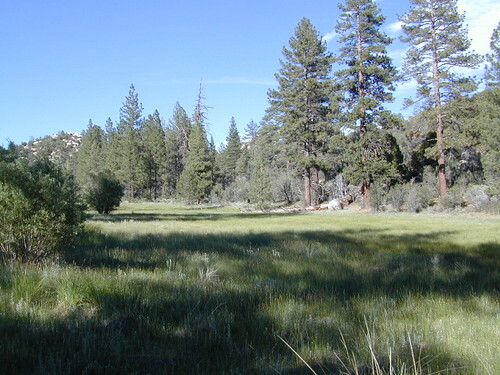 The area is generally as Big Bear - the San Bernardino Forest can get crowded due to the fact that it is located next to Los Angeles and SoCal, so if you seek seclusion head north - way north, north of LA, to the Sierra Nevada mountains of Cali.